Winner of the CHOICE Outstanding Academic Book Award for 1996! The letters that Ramanujan wrote to G. H. Hardy on January 16 and February 27, 1913, are two of the most famous letters in the history of mathematics. These and other letters introduced Ramanujan and his remarkable theorems to the world and stimulated much research, especially in the 1920s and 1930s. This book brings together many letters to, from, and about Ramanujan. The letters came from the National Archives in Delhi, the Archives in the State of Tamil Nadu, and a variety of other sources. Helping to orient the reader is the extensive commentary, both mathematical and cultural, by Berndt and Rankin; in particular, they discuss in detail the history, up to the present day, of each mathematical result in the letters. Containing many letters that have never been published before, this book will appeal to those interested in Ramanujan's mathematics as well as those wanting to learn more about the personal side of his life. 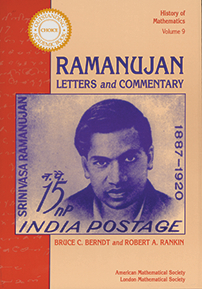 Ramanujan: Letters and Commentary was selected for the CHOICE list of Outstanding Academic Books for 1996. This commendable collection … is a unique contribution to the history of mathematics for at least two reasons. It has brought together precious documents scattered in many places and provides the reader with a wealth of interesting matters related to one of the luminaries in the world of mathematics. Second, through brief and insightful notes and commentaries, the work throws light on many an interesting side street connecting to the grand avenue of knowledge on which we are riding. With resuscitations of some fading photographs and an impressive list of more than 300 references, this book is a very valuable addition to the literature on Ramanujan. Delightful reading … a useful reference on English analysts and number theorists of Hardy's time … has many pictures, some of them quite marvelous … What Berndt and Rankin have done is to make a great deal of primary material available to … scholars. Berndt and Rankin have produced a book that should appeal to everyone with an interest in mathematics … what better way to understand the man behind the mathematician Ramanujan than to read letters written by him and about him? Berndt, with the experience he has gained editing Ramanujan's notebooks, and Rankin, one of the veterans in this field who knew Hardy, Littlewood, Watson, and other British contemporaries of Ramanujan, have combined perfectly to produce this book. [The] filling in of details previously overlooked is one of the merits of the … book … Those who helped Ramanujan have our gratitude, for they found many things which we still would not have discovered without his deep insight into the structure of formulas. This book helps us realize who helped and how in more detail than was possible before reading some of the letters. The book is very readable, contains much material not available elsewhere and can be read at a variety of levels, so it can be highly recommended to anyone with an interest in Ramanujan. The commentary … is marvelously thorough … no detail escapes [the authors'] attention … they have endeavoured to put together as many letters as possible … Berndt and Rankin's efforts at tracing the history and impact of each theorem presented by Ramanujan in his letters … will undoubtedly be of use to those interested in Ramanujan's mathematics. Very carefully prepared book … a lively story told in letters, and an important source to the history of mathematics in this century. The letters that Ramanujan wrote to G. H. Hardy on January 16 and February 27, 1913, are two of the most famous letters in the history of mathematics. These and other letters introduced Ramanujan and his remarkable theorems to the world and stimulated much research, especially in the 1920s and 1930s. This book brings together many letters to, from and about Ramanujan. Helping to orient the reader is the extensive commentary, mathematical and cultural, by Berndt and Rankin; in particular, they discuss in detail the history, up to the present day, of each mathematical result in the letters.